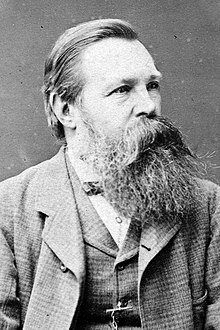 ↑ Norman Levine, Divergent Paths: The Hegelian Foundations of Marx's Method, Lexington Books, 2006, p. 92: "the Young never graduated from the gymnasium, never went to university..."
↑ "Engels". Random House Webster's Unabridged Dictionary. ↑ ၃.၀ ၃.၁ Merriam-Webster, "Engels". ↑ Hunt, Tristram (2009), Marx's General: The Revolutionary Life of Friedrich Engels, Metropolitan/Henry Holt & Co.